Jacqui True is Professor of Politics and International Relations at Monash University with her PhD in Political Science from York University, Canada.Previously she has taught and researched at Michigan State University, the University of Southern California and the University of Auckland. 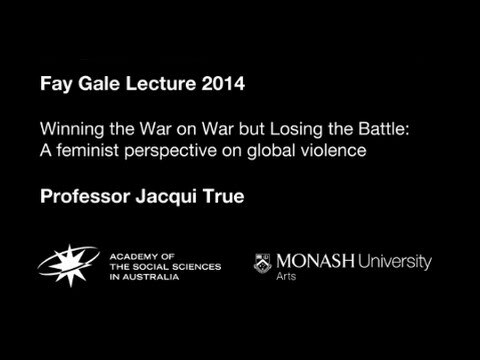 Professor True has published extensively in the field of gender and international relations. Her current research is focused on the UN Women, Peace and Security agenda, and with Dr Sara Davies on the prevention of sexual violence in conflict in Asia Pacific. Her book, The Political Economy of Violence against Women (Oxford University Press, 2012) won the American Political Science Association’s 2012 biennial prize for the best book on human rights and the British International Studies Association’s 2013 International Political Economy book prize.